The existing Wolf River Bridge will remain open to local traffic and emergency vehicles until the new bridge has been completed in 2018. Pedestrian traffic across the existing bridge will cease in late September. The remainder of the WIS 116 roadway will be closed to through traffic during urban reconstruction in 2018. 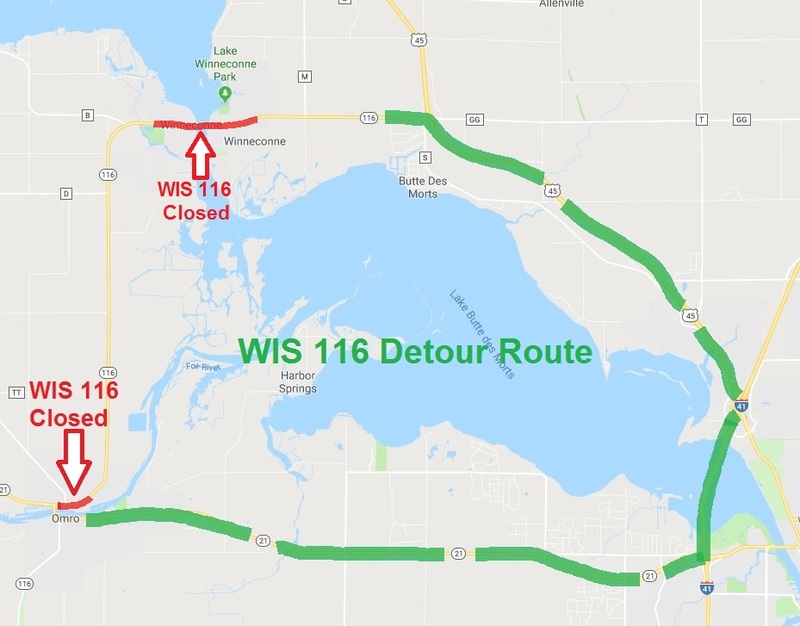 A detour route for WIS 116 will be posted. A local detour route will also be posted. Construction of the bridge and roadway will include staging to allow local access through the Village, access to businesses, and access across the bridge. Access to properties and business will be maintained at all times. WIS 116 is also closed and detoured in the village for Omro for a downtown urban reconstruction project in 2018. WisDOT allows business owners to place temporary signing during construction to direct traffic on alternate streets to their business. For business signing information and a temporary permit application, please see the project overview page. The Main Street reconstruction project will begin on April 2 and will be completed by October 31st. The project will be done in 3 phases and throughout these phases Main Street will be CLOSED to all thru traffic, and the ability to cross the project at various side streets will change throughout the duration of the project. Pay close attention to the local detour set up and maintained by the village of Winneconne. The local detour is shaded in blue on the map below and runs all the way to WIS 116. Trucks are allowed to use this local detour. Access to local residents will be maintained through the majority. Driveway access may be closed for up to a week to allow the contractor to reconstruct the driveways and provide proper cure time for concrete. Pedestrian access will be available on one side of the street throughout construction activities. Safety is very important to us, and everyone must work together to keep both the public and the workers safe throughout construction. The first phase of the project will occur on the west side of the bridge beginning at 2nd Street and extending just west of 3rd street (shaded green on map). Main Street will be CLOSED entirely to thru traffic. During this phase, all underground utilities will be installed, roadway will be excavated, sidewalks will be removed and reconstructed, curb and gutter installed, as well as asphalt pavement. This phase will run from April 2 to June 15. The second phase will begin simultaneously with Phase 1, and will take place from 2nd Avenue to just east of 7th Avenue (shaded yellow on map). Main Street will be CLOSED entirely to thru traffic. During this phase, all underground utilities will be installed along with roadway, sidewalks, curb and gutter, asphalt pavement, and landscaping. North/south cross traffic on 3rd, 4th, and 7th Avenue will be maintained throughout this phase to local traffic only. This phase will begin April 2 and will be completed by September 4. The third phase of the project will consist of finishing the remainder of the job (shaded red on the map). This phase will have ongoing work from middle of April until October 31. It is very important to pay close attention to the local detour signs and road closed signs throughout the entire project because the ability to cross the project on side streets will change daily depending on the construction activity that is occurring each day. Main Street will be CLOSED entirely to thru traffic. There will also be underground utility and road work being done on 3rd Street, 4th Street, and Adams Street as part of a separate village project. WIS 116 open to two-way traffic but may be restricted to one-lane during non-peak daytime hours using flagging operations. WIS 116 restored to full two-way operation during non-working hours. South 1st Avenue closed permanently. South 1st Street and North 1st Avenue closed for roughly 4 weeks during this stage. WIS 116 open to two-way traffic between 1st Street and 2nd Avenue. WIS 116 may be restricted to one-lane during non-peak daytime hours using flagging operations but must be restored to full two-way operation during non-working hours. WIS 116 closed from west village limits to 2nd Street, and from 2nd Avenue to east village limits for WIS 116 urban reconstruction project. Posted WisDOT posted detour follows US 45 to US 41 to WIS 21. 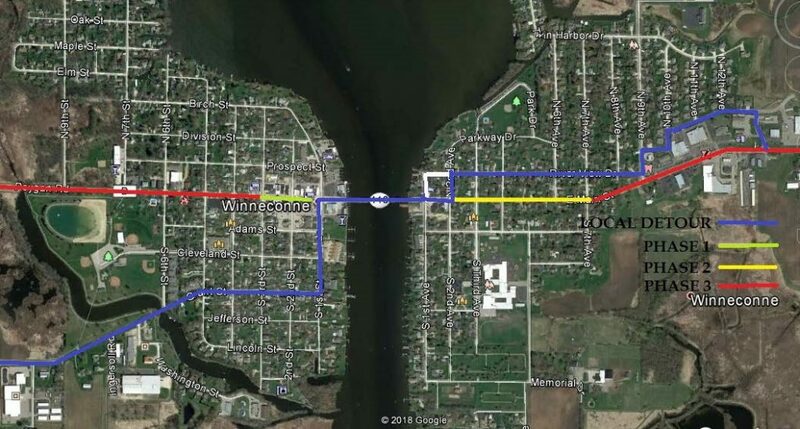 A local road detour is posted by the village of Winneconne. Truck traffic may use this local road detour. Alternate route for truck access: WIS 116 to County D, then west on County D to WIS 49, then south on WIS 49 to WIS 21, then back east on WIS 21. WIS 116 remains closed from west village limits to 2nd Street and from 2nd Avenue to east village limits. Posted detour follows US 45 to US 41 to WIS 21. 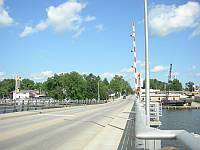 Pedestrian traffic across the existing bridge will cease in late September. WIS 116 open to two-way traffic between 1st Street and 1st Avenue. Westbound traffic uses existing bridge and eastbound traffic uses new bridge. Access across 1st Street closed during this stage. Short-term closure of North 2nd Avenue. WIS 116 remains closed from west village limits to 2nd Street and from 2nd Avenue to east village limits as part of Main Street reconstruction project. Posted WIS 116 detour follows US 45 to I-41 to WIS 21. WIS 116 open to two-way traffic on new bridge. Flagging operations for short-term traffic impacts related to construction vehicle ingress & egress during construction of new fishing platforms. Short-term closures of North 1st Street and North 1st Avenue. WIS 116 remains closed from west village limits to 2nd Street and from 2nd Avenue to east village limits as part of Main Street reconstruction project until late 2018. WIS 116 open through remainder of village limits.